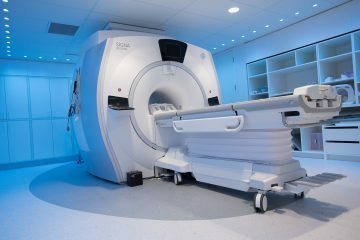 The General Electric Healthcare (GE) Signa PET/MR scanner is now live in the Charles E. Fipke Integrated Neuroimaging Suite located in the lower level of the Djavad Mowafaghian Centre for Brain Health. The GE SIGNA™ PET/MR is a fully integrated 3T PET/MR system built with pioneering Time-of-Flight (TOF) technology and a 3.0T MR. Its impressive quantitative accuracy and high count rate combined with innovative Q.Clear reconstruction delivers 2x improvement in image quality. The system is fully capable of simultaneous PET/MR in the same field of view, presented as co-localized databases. FMRI functionality is also available. The SIGNA PET/MR comes standard with a package of pulse sequences and applications for exceptional 3.0T MR imaging performance.